A tomb that was designed but never realised by modernist architect Adolf Loos has been built by British architect Sam Jacob in a historic London cemetery. Sam Jacob Studio has erected the mausoleum that Loos designed for art historian Max Dvorák in 1921. It stands in Highgate Cemetery – arguably London's most famous burial ground, home to the graves of Karl Marx and Lucian Freud. But while the Austrian architect's design was for a structure built from large stone blocks, London-based Jacob has created the ziggurat-like form using a lightweight timber frame and scaffolding net – making it transparent. Jacob describes the structure as "a ghostly reenactment of an unrealised architectural idea". "Though never built, the image of Loos' design has haunted architectural culture ever since," he explained. 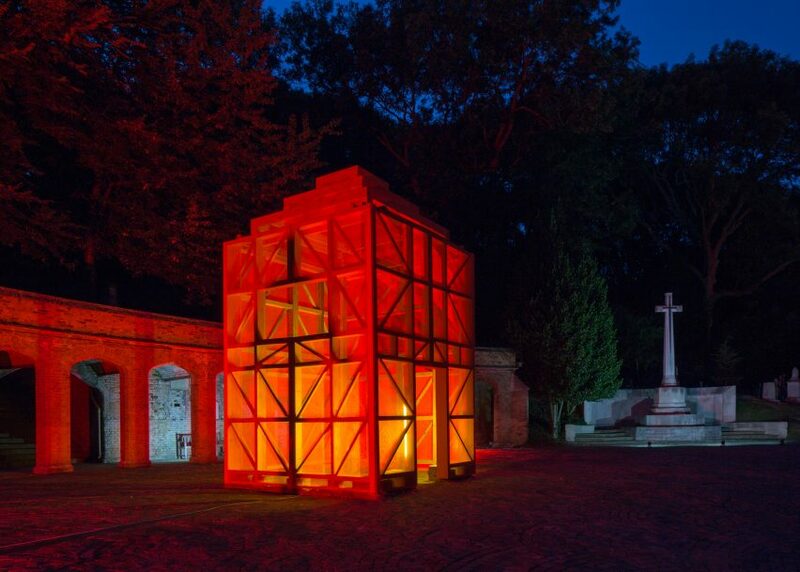 Built by volunteers, the structure will provide the setting for a series of events organised by London's Architecture Foundation to look at how themes of loss and resurrection are addressed in architecture. It is called A Very Small Part of Architecture in reference to Loos' 1910 essay Architecture, in which he argues that "only a very small part of architecture belongs to the realm of art: the tomb and the monument". The architect describes the structure as "a ghostly reenactment of an unrealised architectural idea"
"Built within Highgate Cemetery, amongst the many monuments and memorials to the dead, A Very Small Part Of Architecture makes a different kind of memorial," said Jacob. "Not one dedicated to a person, an event or a moment in time, not designed to remember the past but instead to imagine other possibilities, altered presents and alternative futures." The three-day event programme, called Good Grief, kicks off today with a talk looking at the implication of Brexit for the built environment. This will be followed up by discussions about the architectural legacy of Zaha Hadid and the culture of memorialisation in London. Speakers include Zaha Hadid Architects director Patrik Schumacher, former British Council director Vicky Richardson, architect Hugh Strange, DSDHA co-founder Deborah Saunt and Architecture Foundation director Ellis Woodman. Jacob – a Dezeen columnist, and former director of the now-defunct studio FAT – was the curator of the British Pavilion at the Venice Architecture Biennale 2014, where he charted the nation's history of modernism. He also recently created a replica of a refugee shelter as part of a V&A exhibition about the role of copying in design. Photography is by Sarah J Duncan.